Allow Tour Editing: gives the customer permission to edit basic information on the tour (renaming/rearranging images, changing the music, adding MLS information and custom links, etc). Allow Media Uploads: gives the customer permission to add additional images, panoramas, and/or videos to the tour. Allow Photo Downloads: gives the customer permission to download the tour images, including floor plans. MLS Photo Resizing Policy: this setting determines how the images will be adjusted when resizing them to fit the specified MLS dimensions. Allow Print Quality Image Downloads: We will retain your original image files for one year after they are uploaded. Turning this on will allow the customer to download the original, print quality images (but only for up to one year - the expiration date will be visible in their client panel download center). Print Quality Behavior: this setting specifies how print quality images are stored. Allow Video Downloads: gives the customer permission to download video files from the tour. Allow Panorama Downloads: gives the customer permission to download panorama files from the tour. Zip Download Subfolder Delimiter: place images in sub-folders based on presence of delimiter in media names, ex. Unit 101/Foyer. There are additional settings that can only be controlled at the photographer admin level. 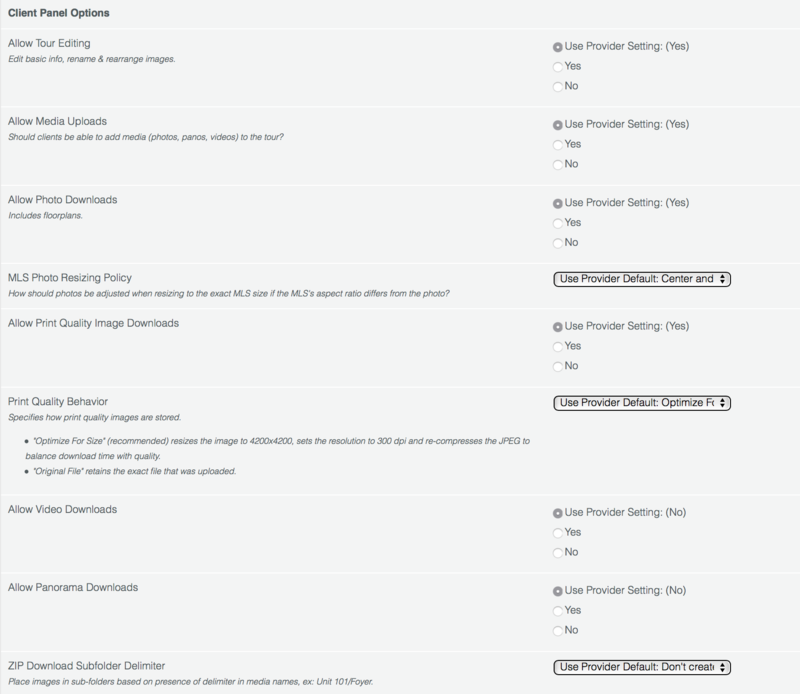 You can view these by going to My Account>Account Settings>Client Panel Options. Enable Export-to-Video Prompt: gives the customer the permission to request an mp4 video export of the tour. 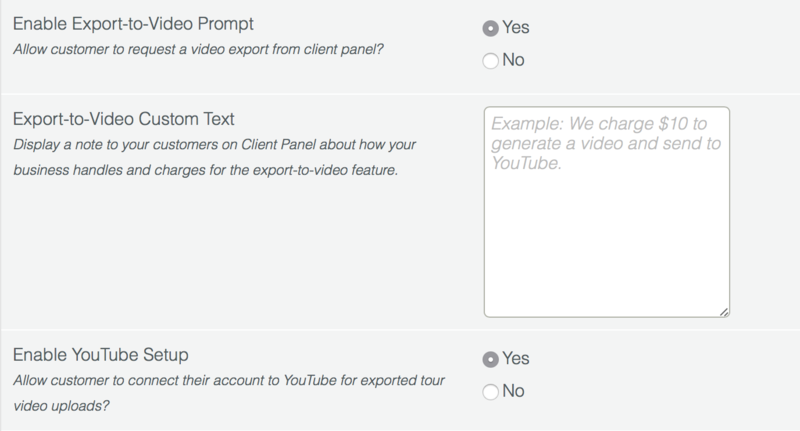 Export-to-Video Custom Text: Display a note to your customers in their Client Panel about how your business handles and charges for the export-to-video feature. Enable YouTube Setup: Allow your customer to connect their account to YouTube for automatic exported tour video uploads.